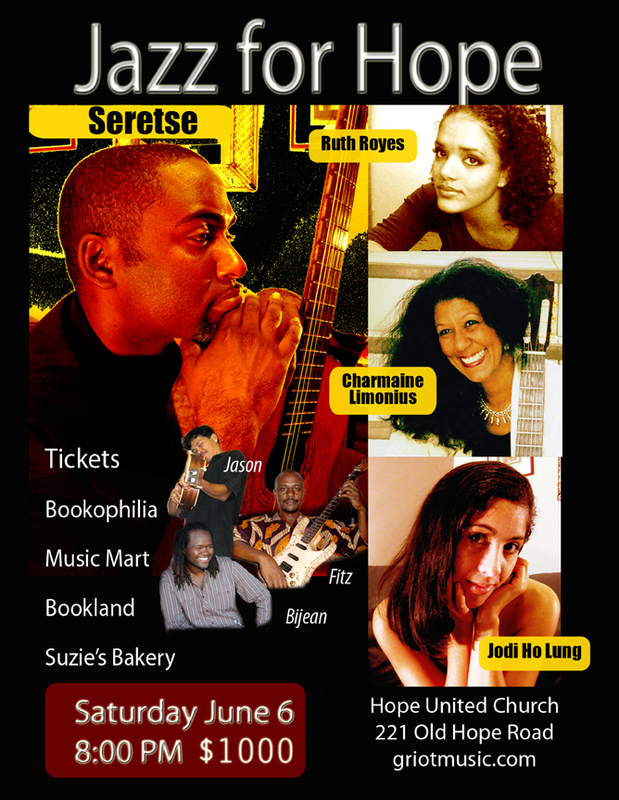 “Jazz for Hope” the annual fundraiser presented by the Hope United Church in association with Griot Music will be having their ninth installment featuring Jamaican Guitarist Seretse Small on Saturday, June 6 starting at 8:00 pm. The concert will take place in the Church Hall at 221 Old Hope Road and will feature Seretse’s musical arrangements of great songs in the styles of Gospel, Jazz & Popular music. Special guests for the performance include Ruth Royes who is a young Jamaican singer who is studying Jazz in Canada, Charmaine Limonius who is a singer/guitarist in the vein of Joni Mitchell, Jodi Ho Lung a semi classical singer who loves musical theatre, Bijean Gayle a singer/songwriter who is making waves with an acoustic dancehall sound, and guitarists Fitzroy Bennett and Jason Worten. The concert series began in 2000 when Seretse was approached by church member Arlene Campbell to assist in the production of a fundraising event to raise money for the construction of an administrative block and outreach centre for the Church. Seretse was the first performer that year and since then series has featured artists like Karen Smith, Kathy Brown, Ozou’ne, Othniel Lewis, Benjy Myaz, Dwight Richards and others. Since the inception of the series it has raised almost half a million Jamaican dollars from the proceeds and this is has been used to help finance the church’s outreach programs in the surrounding communities. Tickets are available at Bookophilia, Music Mart, Bookland and Susie’s Bakery.